7 taste uthappam recipe | Easy breakfast recipes | Cook Click N Devour!!! 7 taste uthappam or 5 taste uthappam is a very popluar tiffin option you will find in menus of popular restaurants in Chennai. 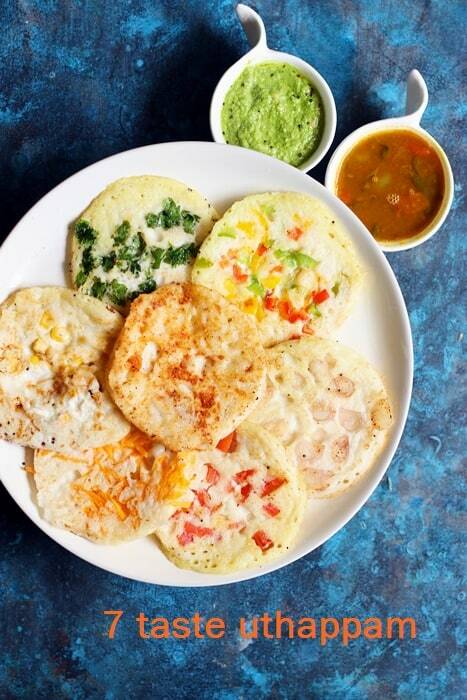 7 taste uthappam is basically a platter of 7 mini uthappams with different toppings. The toppings actually varies from place to place and when you make at home you can add whatever topping you prefer. This is a very good breakfast for toddlers and kids. very healthy, easy to make and colorful for them to actually like it too. To make 7 taste uthappam recipe, I have used small onions, tomatoes, idli podi, capsicum, corn-cheese, carrot and cilantro leaves as topping. Each topping goes on each mini uthappam. Arrange in a plate and serve with chutney or sambar. Truth be said, I would not want a side dish for this platter 🙂 This post is more of an idea than a recipe, you can even make 5 taste uthappam or 3 taste uthappam as per your choice. Be creative and make beets uthappam, pizza uthappam as a part of this platter. Here is how to make 7 taste uthappam with step by step photos. 1. Heat an iron tava and once it is hot maintain low medium flame. The uthappam will be thick and fluffy, so they need to cook in low-medium flame. 2. Pour a small ladle full of idli batter and spread very lightly if required. Drizzle some oil over the edges and on top. Sprinkle the topping you chose. Drizzle some more oil. Cover and cook for 2-3 minutes. This ensures a nice crispy crust. For cheese uthappam cover and cook till the cheese melts. 3. Arrange in a plate and serve 7 taste uthappam hot. 7 taste uthappam platter as served in saravana Bhavan. Heat an iron tava and once it is hot maintain low medium flame. The uthappam will be thick and fluffy, so they need to cook in low-medium flame. Pour a small ladle full of idli batter and spread very lightly if required. Drizzle some oil over the edges and on top. Sprinkle the topping you chose. Drizzle some more oil. Cover and cook for 2-3 minutes. This ensures a nice crispy crust. For cheese uthappam cover and cook till the cheese melts. Arrange in a plate and serve 7 taste uthappam hot. 1.You can even normal sized uthappam instead of mini ones. 3. You can use ghee instead of oil for onion and podi uthappam.